Recent research has uncovered two facts which paint a different picture of life in the Gascoigne family in the middle and latter part of the nineteenth century. It has been generally accepted that the two heiress's Isabella and Elizabeth Gascoigne were keen on a variety of hobbies more commonly attributed to the male of the species; Photography, Wood Turning and Stained Glass, were all interests that the sisters reputedly enjoyed. Indeed such was the interest that Isabella had in wood turning that she produced a small book on the subject, anonimously published, and written as if by a man; such was the prejudice of the times! Little is known of the interests of Isabella's husband, Frederick. The perceived view appears to be of an individual who dedicated himself to matters of the estates, farming, the mines in Garforth, being the key areas, along with the newly acquired estate Craignish, in Argyleshire, Scotland, after 1852. Along with his military activities in Yorkshire. It now is apparent that Frederick was also a keen photographer, making him and his wife along with their friend the architect George Fowler Jones, all enthusiastic amateurs at a time when photography was in its infancy. I have previously written of the discovery of the sizeable collection of George Fowler Jones calotype negatives, and eventually I hope to bring some of his collection for readers to experience here. But this new find, albeit without any of the actual photographs themselves, demonstrates that Frederick was an ethusiast in the then black art of photography. The 1885 plan of the hall which shows a photographic room takes on a new slant with this latest discovery, it must have been the very hub of the house! From an article in the Leeds Mercury, dated Wednesday 5th November 1862 it seems that Frederick was to exhibit his collection of over 200 photographs at a bazaar to be held in the Leeds Town Hall, in aid of the Hospital for Women and Children in Leeds. The article continues ... held in the Town Hall this day, to-morrow and Friday. The collection consists of upwards of 200 views taken during tours in the Mediterranean, in Spain, Rome, Naples, Pompei, Egypt, the isalnds of Rhodes, Crete, Corsica (A view of the birthplace of Napoeon I. ), Sardinia, and Caprera, with several views of the residence of Garibaldi, and also his portrait, presented by himself. The hospital was a favoured destination for donations by Isabella Gascoigne, and a number of references over the years of her contributions can be found amongst the newspaper archives. Clearly the exhibition would have presented photographic prints around 7" x 5" or 8" x 6", presumably hand developed at Parlington. On its own this is significant, but clearly the scope of the subjects requires either many visits or a Grand Tour by Frederick and Isabella. The Ibis was clearly an impressive vessel, more than capable of traversing the oceans of the world, and having both steam and sail, schooner style, she would have cut a dashing sight on the high seas! Clearly the ideal way to tour the mediteranean. All the home conforts aboard, without having to worry about 'Johnny Foreigner' when visiting the sights, particularly in the Near East! A Further Reference to the Gascoigne Steam Yacht? An extract from the Hampshire Telegraph and Sussex Chronicle (Portsmouth, England), Saturday, February 13, 1875. The yacht Ellen sailed from Cowes on Tuesday for Gibraltar, to take in her owner, and will then proceed up the Mediterranean. - Mr G.R. Stephenson's yacht Northumbria left on Wednsday for Nice. - The Stella left the same day for Torquay, from whence she will proceed to the Mediterranean. - The yacht Ibis [Could this be the Gascoigne steam yacht?] has arrived from the eastward, and is now in the roadstead. - Mr. Broadwood's splendid steam yacht Minerva is on Hansen's slip getting ready for a cruise. - H.M. cruiser Ranger has come into harbour to refit, which will be done at Mr. John White's establishment. 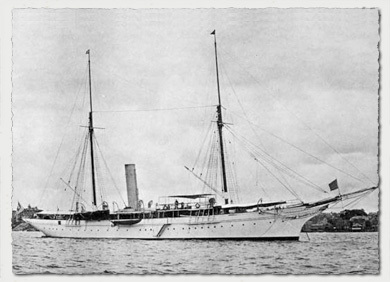 Sadly thus far, I have been unable to discover what became of the yacht, in later years Frederick Richard, the old colonel's son owned a couple of yachts, but nothing on the scale of the SY Ibis. Contemporary writers give an insight into the usage and style of these fine yachts. The English yacht stayed in commission most of the year, spending winters in the Mediterranean and cruising the picturesque waters of Scotland and Norway in the Summer. 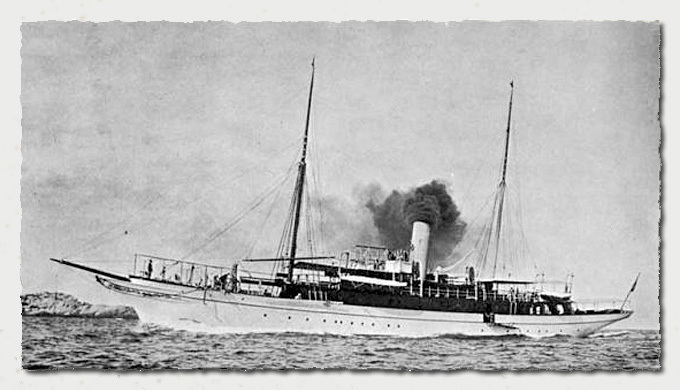 As a general rule the English steam yachts were strongly and heavily built. They were much of the same model as the iron scottish clipper ships and not only were remarkably good sea boats, but some of them were probably the most beautiful vesels ever built. One of the things that added to their steadiness and comfort was their large displacement or weight, some of the weight coming from the very heavy power plants used which generally consisted of a so-called Scotch Boiler furnishing steam to a slow turning engine mostly made of cast iron. English steam yachts were the finest moving homes ever built, or perhaps that ever will be built! Some articles contain extracts, these are copyright to the respective publication, which will be stated along with a link to the source article, where available.